When you’re trying to figure out your Sealing Flagstone Patio situations, you’re probably trying to understand what to do about your sandstone. Are you ready to make sure you have quality stones and top notch sealants that make them work well? Whatever the case may be, you’ll be able to trust in our professionals. 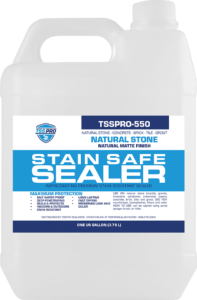 With TSS PRO Sealants on your side, you won’t have to struggle with your flagstone not making the most out of its setup anymore. Flagstone is one of the most common stones in all of the world. If you’re trying to find some type of affordable elegance in your building, you’ve probably chosen this as your surface of choice. Are you trying to make sure you have a quality sealant for your residence’s pool eck? Perhaps your commercial countertop is looking a little bit withered and you need some help with it. While you might be going through this alone, you’ll be able to change that once you have our sealants in hand. Keep in mind that when you’re using flagstone, you’re going to have to keep in mind the furniture you have on top of it. This can do a lot of damage to it if you don’t be extremely careful. Are you trying to figure out how you’re going to stop your outdoor sofa from scraping up your tapestry? Perhaps you’ve got a grill that has put in a lot of etching that you don’t know will be able to be removed. If you’d like some help with this and you don’t know how you’re going to be able to do it, make sure you call in our team. Also known as sandstone, flagstone is an extremely common mineral. Are you someone who frequently spends time outside and exploring around your nearest big city? If so, you’ve most definitely encountered sandstone many times. This is something that we really want to take care of, and it can be tough when you don’t have anyone who’s on your side and knowledgeable of the situation. When this is on your mind, make sure you’re able to count on our professionals. The TSS-PRO 100 is a great resource if you’re trying to find a nice sealant that helps you in the right ways. Are you looking to provide your surfaces with a quality sealing that doesn’t contain any harsh chemicals? If you’re looking for a way to keep your flagstone sealed or years to come, you definitely want a powerful sealant. However, it’s important to remember that you don’t want something that’s not going to be completely organic. This is where it can get tricky, but our PRO-100 sealant is free from any falseness. If you want an all-natural line of sealers to help your stone, this is the place for you. You’ll also want to make sure you have the TSS PRO-200 in mind when you’re in need of a more high performance cleansing before Sealing Flagstone Patio. Are you ready to figure out how you’re going to be able to make the most out of your sealant needs, and you want the heaviest hitters on your team? If you’d like to find out how you’re going to be able to overcome this, trust in our sealants. These devices provide you with a way to seal your floors and keep out grime for years to come. Flagstone is something that you’ll definitely be able to handle when you have our products on your side. Do you need some type of organic, all-natural sealant that’s going to help you keep your stones and surfaces in the best conditions possible? This isn’t something that every single manufacturer can stand by. If you’d like to find a place that can stand out, you can count on us to assist you. We understand that your stones are part of what make you happy, and we want to be there for you when you’re in need of assistance. Before any type of sealing, it’s always important to remember that you completely clean up your stones. If you’re trying to seal something, it somewht defeats the purpose of the entire process if you simply coat your grime with sealant. Make sure your grout lines are completely free from any dirt, dust, and debris. In turn, you will have a much cleaner sealing that lasts even longer. Don’t be discouraged by what’s going on with your dirty, old, withered stones. You’ll have a restoration in no time if you start with our quality products. TSS will never let you down, and our line of sealants are here to stay. Invest in your stones and surfaces today by picking the product that fits your needs the best. TSS-PRO Sealants never want to be expensive and out of the ordinary. Are you trying to make sure you’re able to figure out your sealant needs and save money at the same time? When this happens, you may not know how to handle your situation. Why not call in our team and make the most of what’s going on? Affordable sealing products are absolutely essential, and you have every right to feel like you’re not getting the best price with your company. By switching to TSS PRO Sealants, you’ll be getting much more than a discount. You’ll be unlocking access to the best sealants in America. If you’re ready to start up your Sealing Flagstone Patio endeavors again, you can count on our professionals to make the most of your situation. We care about the many sealants and situations that you may be looking for. With our team behind you, you won’t have to worry about ever not having an organic, all-natural sealing never again. Whether it’s flagstone, quartz, marble, or something else entirely, you can believe in our team. We’ve worked with some of the brightest minds in the business, and we a great product to show for it. Check out our sealant and re-seal your surfaces today. You won’t regret it.